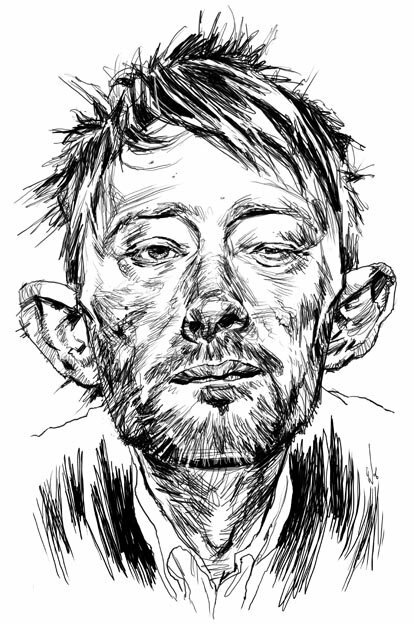 A digital sketch of Radiohead's frontman Thom Yorke, drawn in Photoshop. My entry for this week's Illustration Friday topic- Phobia. Thom has numerous- Claustrophobia, Thanatophobia (fear of death), Aviophobia (fear of flying) but most of all, Motorphobia (he's terrified of cars). holy moly, that is a very striking portrait of Thom Yorke. amazing. Fabulous! Looks exactly like him! his phobias must make it very hard to tour. wonderful... plus who knew I had so much in common with radiohead??! In any case, I don't have Chriswhalartphobia! Nice Drawing! glorious work, very nice rendering. That's an amazing sketch! I'm speechless. I saw Radiohead at Bonnaroo in June. Great show and nice sketch Chris. amazing sketch there, Chris. Although now I think I have thomyorkeaphobia... : ) Seriously, I love the sketchy style. Poor guy, this world isn't a place for him! Marvellous image. Terrific sketch! I'd have never guessed it was done in Photoshop. I love your blog. I check it often. Extremely inspiring body of work. Your caricatures really exemplify how fun the drawing process can be. Sammo- Thanks man. I'll keep that idea in mind for future tutes.